12:58 MM points out that the 20/110 crossing was outside the trade window. So by rule I was right in not taking it. 10:06 regular TG pointed out in the chat room taht today is a gapup day. I have a saying "Gap up, buy a low at 11:00"
There is a Tide time at 11:01 . It was not selected by my trade selection program as a trade time. Gut it bears watching. 5/6/2011 1:12:11 PM MT TG****:: Al, best of luck with your surgery. 5/6/2011 12:14:07 PM MT TG****:: Interesting that price initially crossed through the 110 exma about an hour after the 1100 tide time, now attempting to close back above it about an hour after the 2nd tide time. 5/6/2011 11:43:48 AM MT suraj:: @mm (sorry for the delay in replying I am at work today). Just about 20 miles. 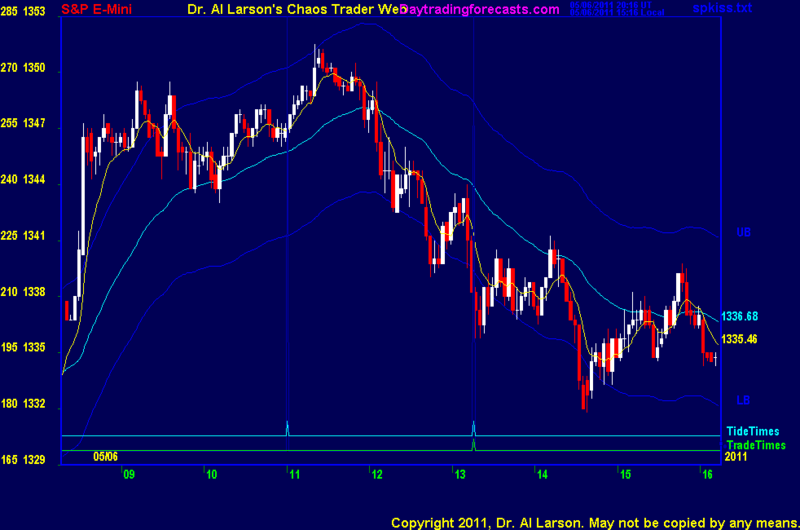 5/6/2011 8:06:22 AM MT Al****:: good point-gap up, buy low at 11 ? 5/6/2011 7:58:39 AM MT TG****:: Al, wouldn't you consider today a large gap up day given the outcry session price jump from settlement to the open. If price isn't making further highs isn't reasonable to expect a push towards closing some of the gap towards the 1101 tide time. 5/6/2011 7:53:46 AM MT TG****:: GM everyone. 5/6/2011 7:21:27 AM MT mm****:: How far north? 5/6/2011 5:52:17 AM MT suraj:: GM MM, all - nice and sunny North of Boston.